I love Villa Blackstone for family vacations. 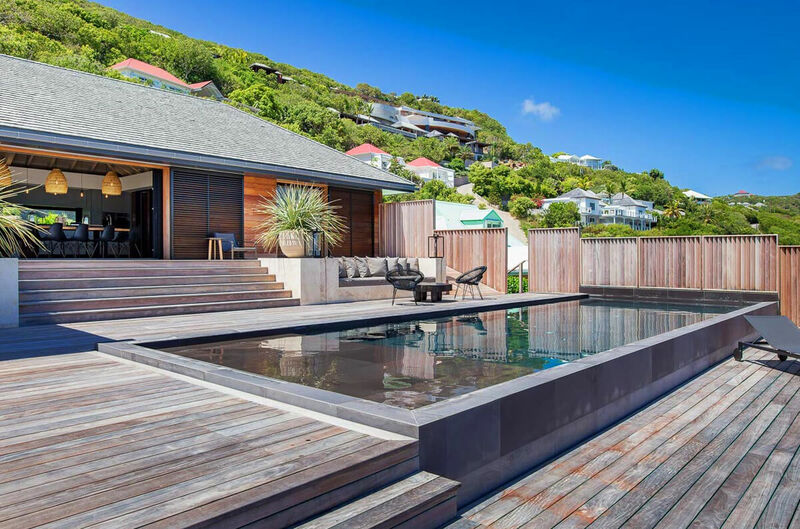 There’s two bedrooms that are connected, a super safe pool terrace with crystal clear glass balconies, and a great hillside location over Marigot Beach. The common area is open and cozy, so you can see kids playing in the pool while cooking dinner in the kitchen. There’s one bedroom in the main house that’s wheelchair accessible, so any traveler can relax at Blackstone. Newly built villa overlooking Marigold Bay! Villa Blackstone is minutes from Marigot Beach, which is rarely crowded and has great snorkeling. This fully air-conditioned villa comes with daily housekeeping and is perfect for families. Blackstone has a multileveled terrace with a glass boundary that maximizes the ocean view. The large lounging deck surrounds the lap pool, and has built-in sofas, outdoor speakers, and umbrella-topped dining areas. Guests can relax in the sun or shade without sacrificing the ocean view thanks to the home’s elevated position. Inside the main pavilion, there’s a living room with a flatscreen Apple TV, Blu-Ray player, tons of seating, and cathedral ceilings. The kitchen sits behind, with built-in appliances, a Nespresso coffeemaker, blender, juicer, a breakfast bar, and a dining table. The room has two walls of sliding glass doors, so everything feels open and airy. The first bedroom is wheelchair accessible and located next to the kitchen. It has a European king bed, ocean views, terrace access, and an ensuite bathroom with an indoor and outdoor shower. The second bedroom is located in a separate bungalow by the pool and has a European king bed, ocean views, terrace access, and an ensuite bathroom. The third and fourth bedrooms are located in a cottage on the lower level and connect to one another. One has a European king bed and opens to the terrace, and the other has two twin beds. Both have ensuite bathrooms, and can be separated from one another with a set of double doors. The fifth and sixth bedrooms are also in the lower level cottage, and both have European king beds, terrace access, and ensuite bathrooms. Blackstone is a 3-minute drive from restaurants, a 5-minute drive from the beach, and a 10-minute drive from shops. This villa is ideal for family vacations, because it’s private but not isolated, and near the beach but not on it.